So I’m a day late with my post this week. I blame it on my lazy Sunday, which made me forget I had a blog to write. This week’s topic is “What do I need to write?” This can be interpreted a few different ways, I’m choosing to go with what are those quirky things I need to have so that I can actually sit down and write? When trying to come up with what I need to have handy to help me accomplish my writing goals, I had a hard time. I’ve never really thought about it much, to be honest. I’ve never thought about the entire writing environment and process in these terms. But I did come up with a few things. Music, I have to have some sort of music playing. I can’t concentrate when there is no background noise. If it’s dead silent, my mind tends to wander more. It’s like there’s a part of my brain that needs to be kept occupied so the other part can concentrate on the task at hand. No clutter is another one. I absolutely cannot concentrate if my office is cluttered in anyway. Even if the first floor of the house needs a good cleaning or straightening, I have a hard time focusing. It’s something about the disorder; it interferes with my ability to think. I was that way all through school, too. I couldn’t concentrate on homework if the area where I was working was a mess. I also need to have some sort of comforting beverage on hand, be it Diet Dr. Pepper (I have a *slight* addiction there) or tea. It usually depends on how cold my office is to determine which one I go with. Hand in hand with things I need are things I don’t need. I really need to learn to turn off the wireless on my computer so I can’t access the internet. I know it’s been said before, but the internet is the downfall of many a writer. There are way too many fun things that can distract when you’re already stuck and can’t decide where to go next. I’ll tell you another thing I don’t need is my cat walking on my laptop, lying on my notebooks, curling up on my arm, and repeatedly rubbing up against the monitor as if to claim it as his. Every time he rubs the corner with his head, he jostles the laptop and closes it just a little bit more. At least he’s affectionate, I guess. So, anyway, there are a few things that either help or interfere with my writing process. What do you need to get those creative thoughts flowing? It’s time for another Monday’s Musings post and our chosen topic this week is favorite movies and TV shows. I’m going to narrow the field down a little bit because I feel like topic is one that could take on a mind of its own. First off, I’m going to stick to movies. 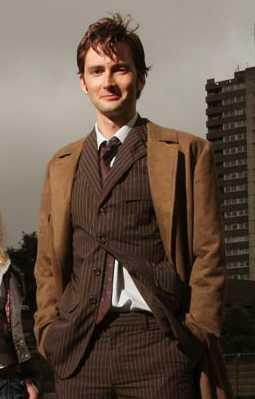 The main reason for that is, I’m completely addicted to a certain TV show at the moment (see last week’s office tour post) and I if I tried to write anything on that topic it would be way more than anyone wants to read and basically just an excuse to include pictures of a certain person. J So instead, I’m going to write only about movies, specifically my top five favorite movies that are based on books. These are in no particular order because I couldn’t possible rate them. One of my all-time favorite books is also one of my all-time favorite movies. Atticus Finch is an amazing father figure and no one could have played him as well as Gregory Peck. Robert Duvall plays the infamous Boo Radley in one of his first film roles. It’s almost strange to see him play such a shy, quiet character since one of the things I’ve always associated with the actor is his powerful voice. The story is one that portrayed a very serious and touchy subject through the eyes of a child, and I think the movie was able to do the same thing in an equally impressive way. While Scout may not have understood 100% of the situation, she experienced the emotions of those around her and knew this wasn’t just any trial for her father. There have been many versions of this move over the years and I’ve seen them all, but my favorite is the version with Wynona Ryder and Susan Sarandon. No one could play Marmee like Susan Sarandon and who doesn’t love a young Christian Bale as Laurie? I especially love the re-creation of Orchard House, which is such an integral part to the story. It was so true to life, it made you feel like a part of the March family and I always wanted to be Jo. While the other versions of the movie are great in their own ways, this one stands out because the actors come across so natural, it pulls you in and you forget you’re even watching a movie. 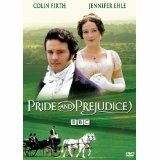 Like Little Women, there are many versions of this movie; my favorite is the BBC version with Colin Firth as Mr. Darcy. Colin Firth *is* Mr. Darcy as far as I’m concerned. This version, while close to five hours long, is totally worth the viewing time. It runs as closely to the book as just about any movie I’ve ever seen and the locations used are straight from Jane Austen’s imagination. This movie is one I always watch when I’m sick, getting lost in the scenery and characters makes me feel better every time. Andre the Giant is wonderful as Fezzik (he is the brute squad) and Billy Crystal is beyond funny has Miracle Max. Westley is the hero we all want who would fight for his love to the end of the earth, even when he’s mostly dead. When I was younger I would get annoyed at the breaks in the story that pulled you back to the present and showed the grandfather and grandson. As I got older though, I realized the importance of those scenes and it just made me appreciate the story more. This one is a new addition to this particular list, I only recently found out it was based on a book. Like the story of Buttercup and Westley, I have watched this movie more times than I can count. So many times, in fact, that when I pulled it out a few weeks ago and watched it for what was probably the first time in five years I still knew every word. 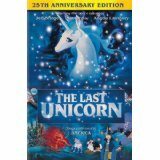 There is a unicorn in a forest who overhears two hunters talking and learns she is the last unicorn left in the world. She meets a butterfly who tells her the story of the Red Bull that took away all the unicorns years ago. She decides to go on a quest to find out if this is true and where the other unicorns are. 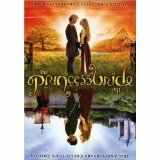 Along the way she meets a magician named Schmendrick who is not the best magician in the world, although he does possess true magic. He decides to accompany the unicorn on her quest. They also pick up one other traveler on the way, a woman named Molly Grue. Eventually they end up at the castle of King Haggard and his son Prince Lir. At this point, the unicorn is in human form (courtesy of Schmendrick) to prevent the Red Bull from discovering who she truly is. Eventually they learn what happened to the unicorns and there is a final showdown. I’m not going to go through the rest of the story because I don’t want to give away the surprises and the ending. This is an absolutely beautiful animated movie; it was really my first exposure to Japanese style animation. The characters are voiced wonderfully (Jeff Bridges, Alan Arkin, Christopher Lee, Mia Farrow) and the band America performs the music. As you can see, I had a hard time toning down the hyperbole in this post; I just love these movies to pieces. If you haven’t seen any of them, I recommend putting them on your watch list as soon as possible. You won’t be disappointed. What about you, what are some of your favorite movies and TV shows? This week, the Monday’s Musings gang is taking you on a tour of our offices/writing spaces/corners of the dungeons where we work. Finally, after months of adjusting and organizing, my office is just about the way I want it. I’ve gone through two desks, three layouts, a paint job and a really bad stenciling job that I still need to paint over, but my space is cozy and comforting. It’s not a very big space, but below are a few pictures to give you an idea of where I spend a fair amount of time. 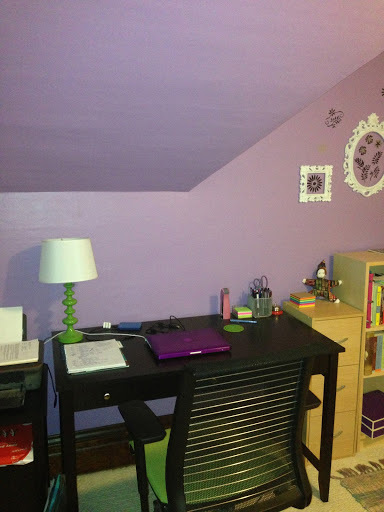 Above is a picture of my desk (the second one I tried) with the green lamp I picked up on a whim. It doesn’t really match, but I don’t care, I like the color. I love the sloping ceiling above the desk; it makes me feel like I’m writing in an out of the way attic room in an old house. 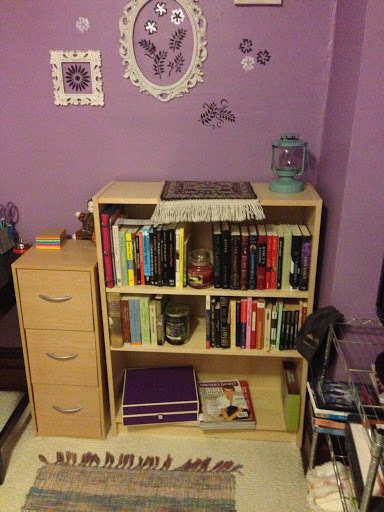 My bookcase. I keep only certain categories of books in my office, the rest are on bigger bookcases in the dining room. This holds my writing and researching books, my physical ‘to be read’ pile (the rest are on my Kindle) and my more inspirational books I guess you could say. My Alcott, Austen, Shakespeare, Whitman, Dickinson, etc. A picture of Louisa May Alcott’s home, Orchard House, that I purchased a few years ago when I visited Concord, MA. Getting to tour Orchard House was a total pilgrimage for me. Little Women has been one of my all time favorite books since the first time I read it in fourth grade. Just a couple more pictures. 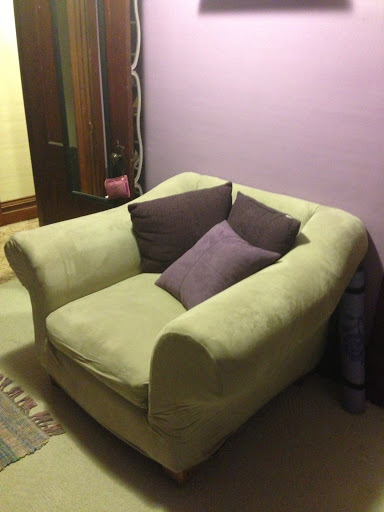 This is my squishy, book-reading chair. 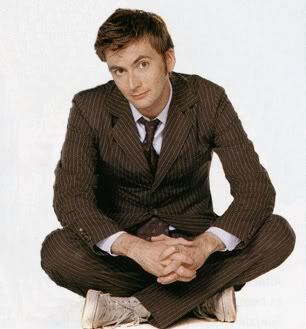 Although lately it’s been my squishy, Doctor Who watching chair. Not that I’m addicted or anything. 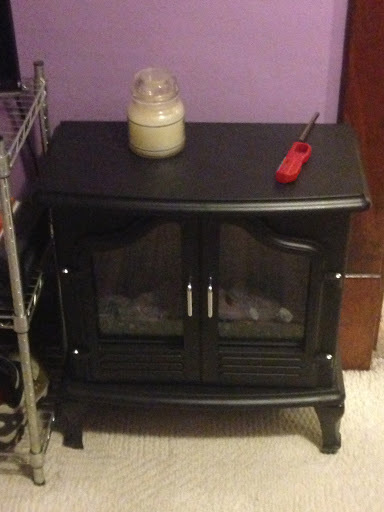 My little electric fireplace that keeps my room cozy warm in the winter. 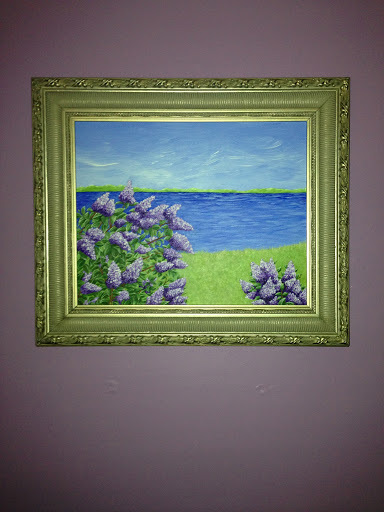 Finally, a picture of purple lilacs (my favorite flower) that my mom painted for me. Can you tell purple is my favorite color? 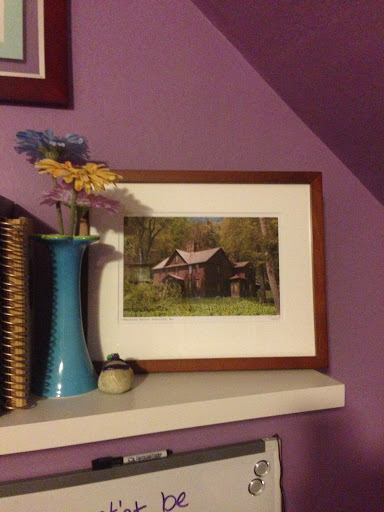 The color in this picture is a little off, the frame is actually silver, but you get the idea. So, that was probably more than you wanted to know about my office and more pictures than you needed, but I’m quite proud of it. 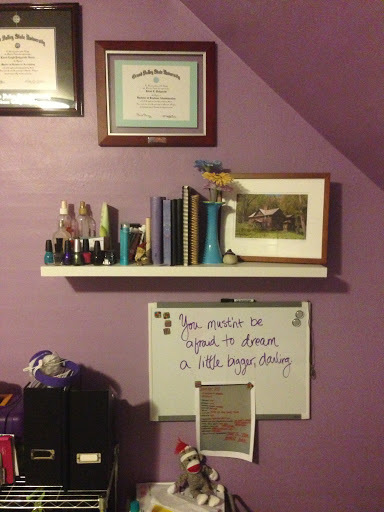 (Except for that terrible stenciling above the bookcase.) It’s comfortable and cozy and I love spending time here. Where do you write? Do you have a dedicated spot or do you like to move around and change it up? This week for Monday’s Musings, we are talking about something a little less literary and a little more personal. The big question is, if you could live anywhere, where would that place be? I’m a bit of a dreamer; I spend more time in my daydreams than is probably healthy. But one of the results of all that time spent in my head, is that I’ve answered this question more times than I can count. If I could live anywhere in the world, where would I live? What kind of life would I lead? Of all the places I’ve imagined, I keep coming back to one. 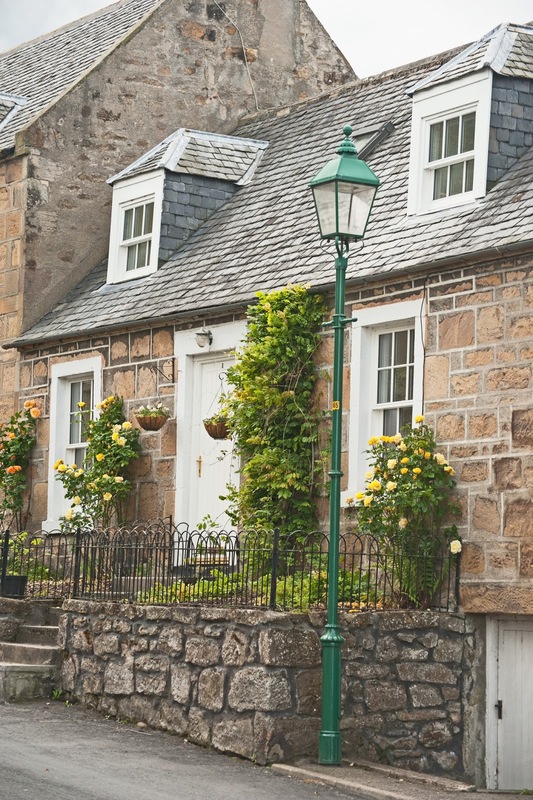 I’ve dreamed of living in a little cottage in the country, somewhere I could have a garden and be at peace. Peace is something I lack in my everyday life. I think a place like the one pictured below would be nothing butpeace; a cozy little stone house with a large fireplace for the winter and big window to gaze out of when I need inspiration. 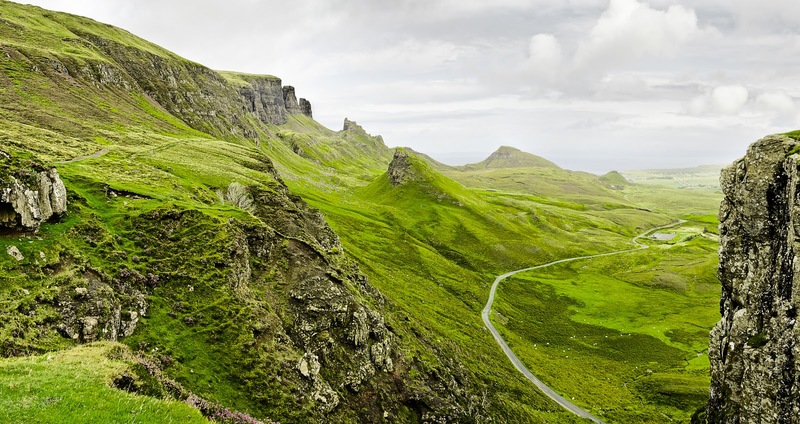 And to be able to walk among the hills and old stone ruins anytime would be simply amazing. Is there anything more beautiful? Of course there’s also the history. While America has its own history that is fascinating and strong, it doesn’t have the age of so many other places in the world. I’ve been doing a lot of research into various aspects of Scottish history for my book, and the more I read the more I love it. Scotland had its savage times, as have many other places, but I’m intrigued by the idea of the old clans and how far back some of them go. To be surrounded by that kind of history would be inspiring on a level I can’t even imagine. And if I’m going to imagine living anywhere I want, then along with that would be any career I want. And if I could do anything I want, it would be to write for a living. Imagine! Living in a peaceful, lovely little cottage in the country and writing full time. When I was thinking about my answer for my post, I realized it’s completely contradictory to one of the answers in my self-interview a couple of weeks ago. The question was basically country or city, and I said city. I think a city would be fun to live in for a few years, to try it out. But not for the long haul. For the long haul I think I want quiet. I tend to be a hermit, it would be so much easier in the country. What about you? If you could live anywhere, where would it be? It’s time for another Monday’s Musings post, this week the topic is genre fiction vs. literary fiction. There is a lot of discussion (and disagreement) about the definitions of genre and literary fiction, let alone which is “better.” So, I guess the first place to start in a discussion of the two is to try to define them. Notice the quotes used in my definitions, they probably give away my thoughts on the subject so I guess they aren’t totally unbiased definitions. In this day and age, I think the line between genre and literary fiction is blurring, if not disappearing completely. When I think of the two categories, I tend to think of books that have been around for a while. Say, the difference between To Kill a Mockingbird (literary) and The Deep Blue Good-by (genre), which is the first Travis McGee novel by John D. MacDonald. To Kill a Mockingbird is considered one of the great pieces of American Literature, a story that has touched millions across generations and still speaks to people today. Whereas the Travis McGee novels are mysteries focused on a sort of bum who helps people recover things. Not what a lot of people would consider great literature. But, if you give them a chance (and I recommend you do), you realize there is more. They are about a guy who seems to be totally self-serving and only helps people when he needs the money, but there’s more to Travis than meets the eye. He has a sense of honor and helps those who need it. What more can you want from a hero? How is that not examining human nature? I think the classifications of these two books are outdated. Today, I think “literary” is a genre of fiction, just like mystery, science fiction and fantasy. What does the literary genre of today look like? It’s hard to pinpoint exactly, in my opinion. I tend to think of it as the category that things fall into if they don’t fall into any other category. Is that a popular opinion? Probably not. People seem to get very bent out of shape when you tell them “literary” isn’t the end all, be all. Or that books in other genres are just as good as “literary” titles. I keep putting that in quotes, I can’t help it. I tend to think it sounds kind of pretentious. When I think of literature, I think older. I think of what I read in my AP English class in high school; Pride and Prejudice, The Sound and The Fury and Crime and Punishment. It’s not that I don’t think people write books that are important anymore, it’s just that what’s written today hasn’t had time to become classic yet. Maybe someday a book that came out last week will be considered a classic, literary novel. The great American novel of the 21st century that will be studied in English classes a hundred years from now. But, I still think it will be considered part of the “literary” genre of fiction. Not a group of fiction above all others. This just my opinion obviously. But, what do you think? I’m taking part in a new mini-blog hop starting today, along with Chris Allen-Riley and Tess Grant. Please be sure to check out their blogs as well by clicking on their names. Each week we are going to choose a specific topic to write about; this week is sort of a mini self-interview. Seriously. I use it all the time, usually with a question mark at the end. I had never actually noticed it until this summer when my brother came to visit and started making fun of me. I mean seriously, what are big brothers for, right? Moist. Hearing it makes my lip curl. Waves crashing. I could listen to that day and night and never get tired of it. People chewing. I have an almost violent reaction to having to listen to other people chew, unless I’m eating something at the same time. Anything that deals with the public in an extended manor on a daily basis; i.e. working in retail or something like that. I don’t have the patience, it’s just best for everyone involved. Fleshing out one small idea that seemingly came from nowhere and seeing it through to the end. Time. I’m so impatient to get a story finished, or to get to the next section, that the actual time it takes to write it frustrates me sometimes. Do you have a day job aside from writing? Yes, I’m an accountant by day. Can’t get much farther being a writer than that. Penguins. But I also really like giraffes, I think they are majestic in their own way. Purple – just about any shade. Tea – preferably Earl Grey or British Breakfast. City, I think. Although I’ve never lived in a big city, I would like to at least try. I like the idea of having so many options of things to do at any given time. That’s a tough one. Original Star Wars, but new Star Trek. Pirate. I don’t have anywhere near the stealth required for a ninja. And pirates dress better. If you were a book, which book would you be? Thanks for visiting today and be sure to check back next week for another topic. And if you feel like sharing, choose a question from above and leave a comment!